The finest teaching tool available! Standing over 4 1/2 feet tall, this 3/4 life-size human replica depicts deep and superficial musculature in addition to the body's major nerves, vessels, tissues and organs in exquisite detail. The internal organs are removable (45 pieces in all) to reveal the fundamental interrelationships of human morphology. Remove the calvarium to view the 3-part removable brain. Look beneath the liver to reveal the gallbladder and bile duct. Peer inside the appendix, stomach lungs, heart or kidney. 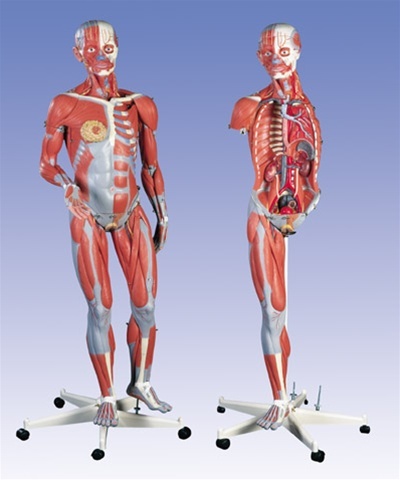 Remove and view the details of 13 different muscles of the arms and legs. Extra shipping charges may apply for this item due to its size and/or weight. A sales representative will contact you with a freight quote if this is the case. Shipping charges are door-to-door. If you require inside delivery, please add this to the comments section when placing your order online or inform you sales representative for a quote.